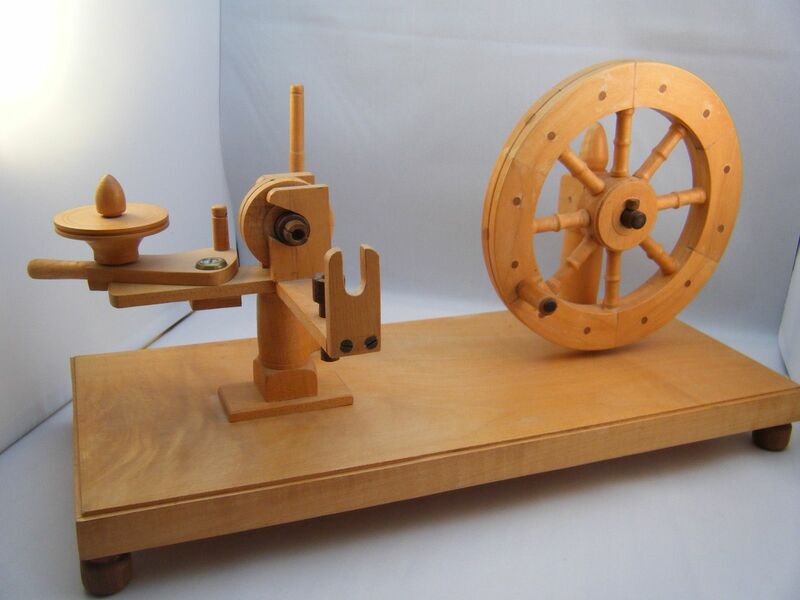 Comments: A bobbin winder made of sycamore which can be used either for Honiton or Midlands bobbins. It can wind bobbins in pairs with an unbroken thread in between (not sure how that works). 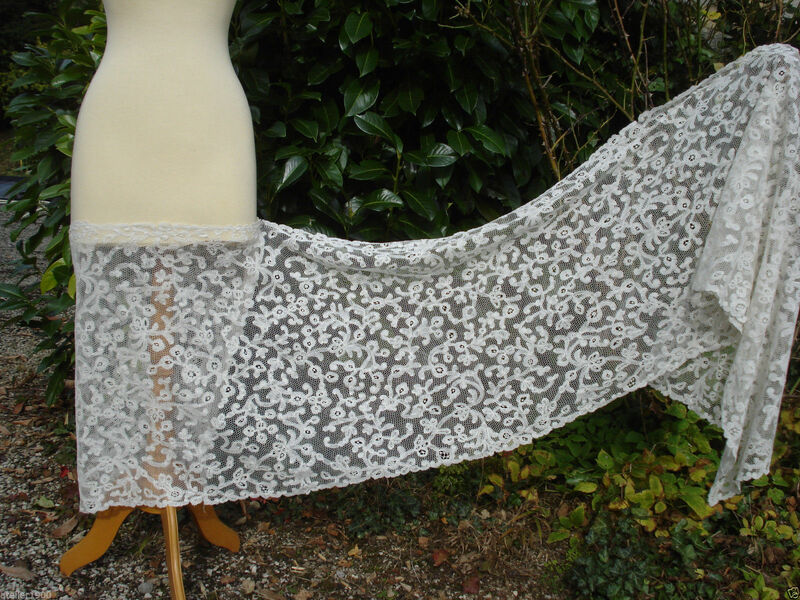 Provenance: Designed and made by the seller’s late father, Reg Higgs, who supplied the English Lace School in the late 1980’s. Modifications: None, just needs a new string drive band. Finish: Original – it’s been in storage. 11/29/2015 – the seller tells me that there is another one of these coming up for auction soon, made of Yew. Sold for £130.99, 9 bidders. Comments: A bonnet veil of Honiton applique on machine net. Very good quality motifs, well out of the snails/slugs style. The overall design is a little odd with very large rather widely spaced floral sprays in the lower portion, just a few small sprigs used as esprits. Well done lower border with thinner side borders. I’m not sure how well this works as a veil. Damage: A major tear repaired just below the center spray (7″ long). Small holes and pinholes in the mesh. Finish: No obvious creases or wrinkles – nice drape to the tulle. Sold for £26.09, 7 bidders. 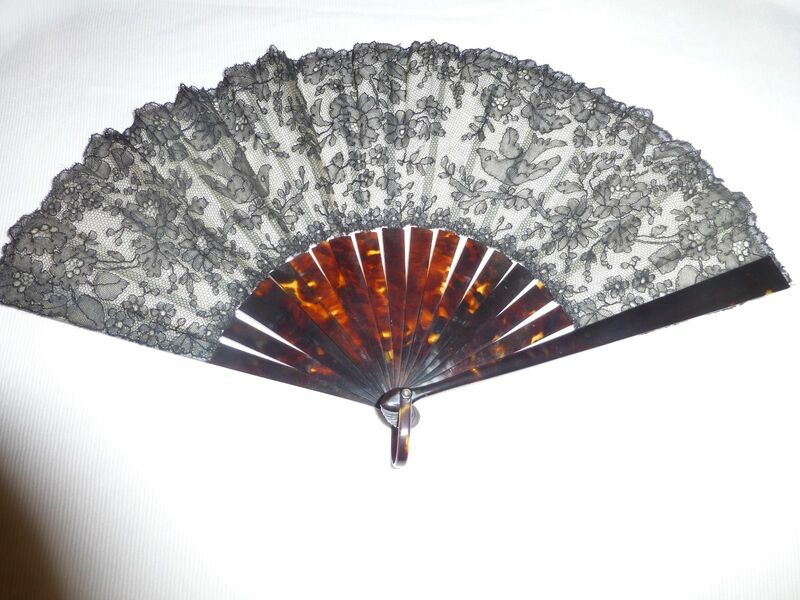 http://tinyurl.com/nkb2nuo TRUE VINTAGE STUNNING LADIES BLACK LACE HAND FAN LOVE BIRDS? Comments: A Chantilly fan. Note the figural work of birds, with conventional flowers in the rest of the design. 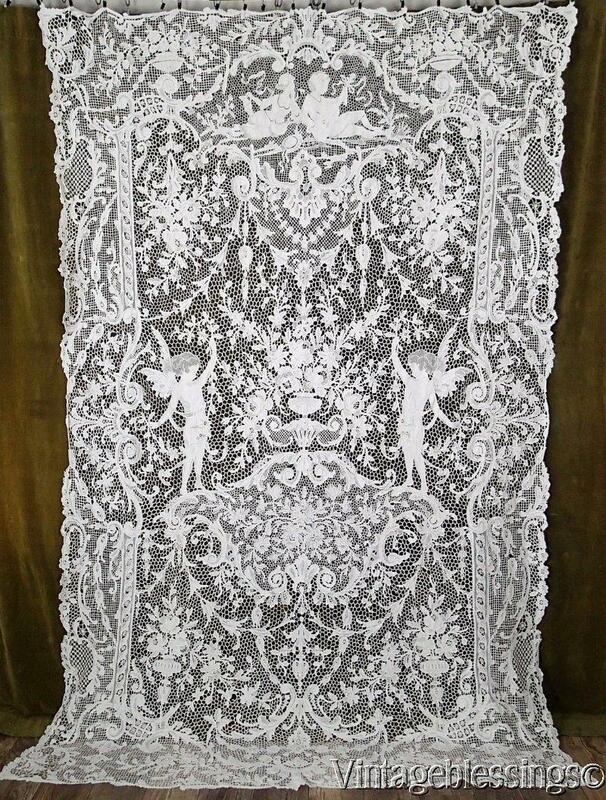 The lace is mounted on a white silk? foundation. I think the sticks are imitation tortoise shell, but the slips might be horn. I’m just not certain, but you might want to get clarification from the seller. Damage: Nothing obvious from the photos. Sticks look OK. Finish: Expected fan creases. I’m not sure what’s going on on the right side, it looks like the piece isn’t fully open for the photo. Sold for $41.00, 2 bidders. Comments: A shawl of pieced bobbinlace with a needle-made mesh ground, sometimes call Point de Milan. I think it’s a Flemish piece. The motifs are large and fairly simple with woven squares used as fillings. 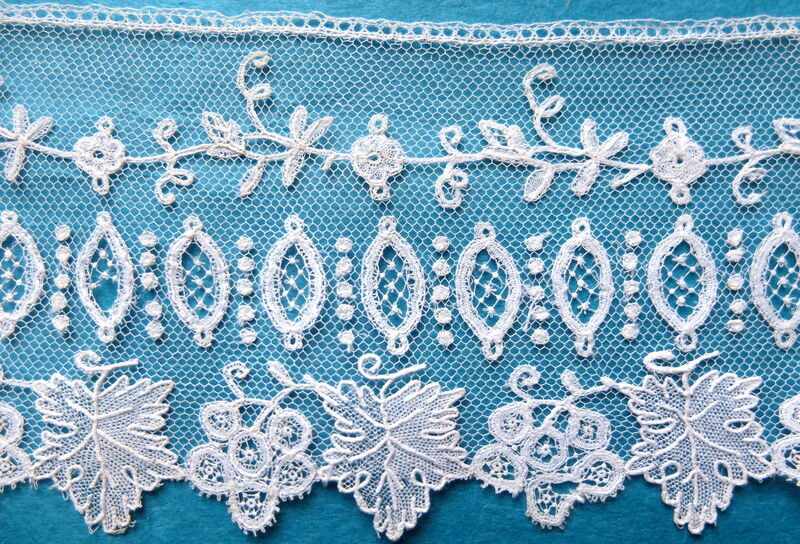 The quality of this type lace varies considerably. The motifs also go under the name ‘Old Flanders’, but are not as refined as many examples. Unsold as of 12/2/2015, 10:11 AM MST. 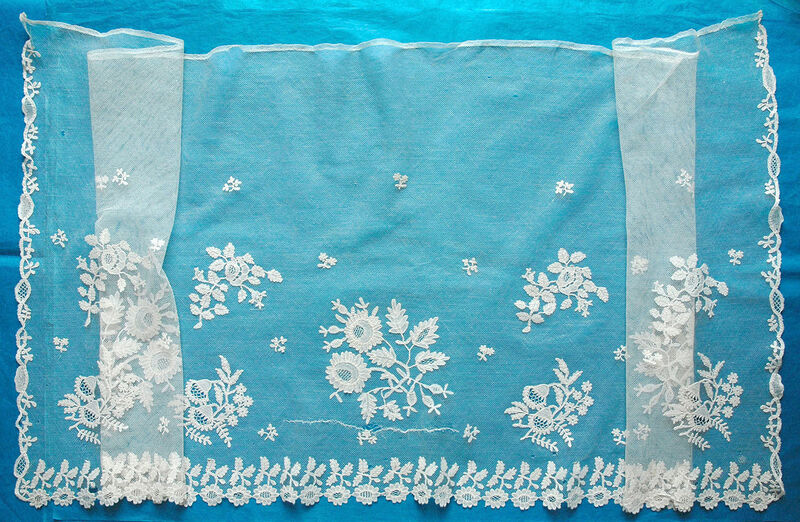 Comments: A lappet scarf of Carrickmacross applique on machine net. It has the typical looped picot edging, and good needlerun fillings. The motifs are a bit large and repetitive, but I’ve never seen a form like this before in C. A. Modifications: Not enough closeups to tell if the lappets have been joined together. Soilage: Looks a yellow in the photos, and seller cites a small area of slight discoloration. 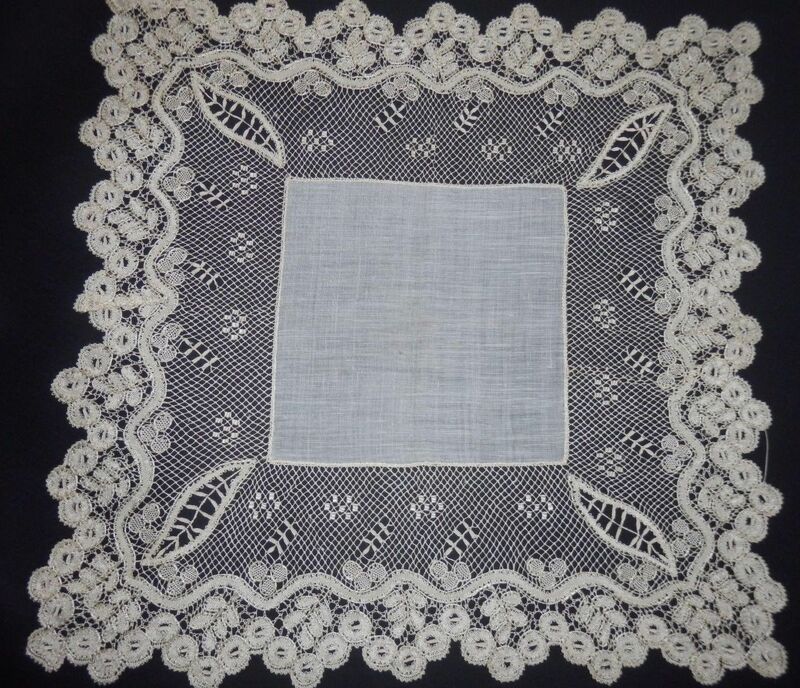 Comments: There are a lot of needlelace Venise-type tablecloths on Ebay, but this one rises well above the average. The quality of the design, especially the figures, is quite high, and the technique is excellent. Note the shading done in some of the clothwork. I’m wondering if this isn’t a Zele piece from Belgium, given the different stitches and bridework used. Provenance: San Francisco estate sale. Damage: Seller points out some breaks in the brides and small holes in the clothwork. Soilage: Seller says it was ‘freshly hand laundered’, but gives no details on the process. Seller also cites a few very light spots. Finish: No obvious creases or winkles. Not quite crisp, might be from the recent or a past wash. Comments: A narrow border of, well, the woven tallies would speak more toward Honiton. But the shapes of the leaves, the lack of roses and the square picoted brides are more a Belgian Duchesse de Bruges. Then again, some of the way the curls are done in motifs look more Devon. I’m not sure on this one, but I’m leaning toward England. Modifications: Looks like both ends are cut, engrelure added. Damage: Some of the flowers missing along the lower edge, along four repeats at the beginning of the border. Soilage: Some localized brown spots. Sold for £16.00, 3 bidders. Offered by: Ebay seller eb330, Boston, New York, United States (Boston isn’t in New York, but that’s what it says). Comments: A set of Carrickmacross guipure cuffs – there is a photo of only one. The looped picots border the edges and all motifs. The motifs are a little rough in design. Note the long fillings, can’t see them clearly enough to say how they were made. Modifications: Can’t see the second cuff. Both are sewn onto paper. Damage: General wear, and some separations along the edge. Soilage: Seller cites minor discoloration. Comments: An Irish Crochet deep collar with a lighter Rose of Sharon pattern along the neck edge, larger motifs on the outside edge. This can be an effective combination, and works pretty well here. Picoted square mesh in both sections – I can’t see how the picots are made. Good raised work in the roses and centers of some flowers. The large motifs include shamrocks, leaves, roses and some unusual flowers. Soilage: Hard to tell, but I think there’s some slight discoloration around the neckline. Comments: There are several pieces in this lot, including some Carrickmacross and Irish Crochet, and a good Schiffli Gros Point copy. 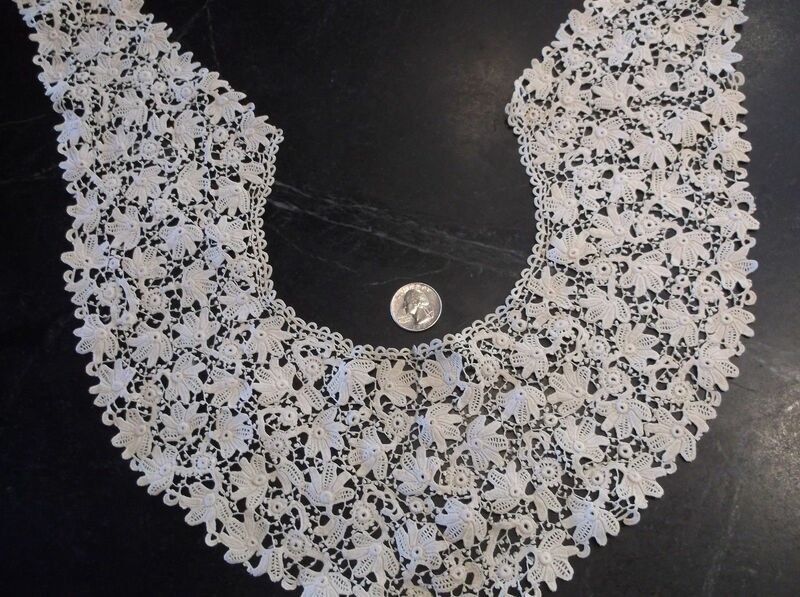 But the one I’d like to talk about is the small-motif Irish Crochet collar. There is one small 5-leaf motif, along with some smaller flowers with raised ring centers. Irregular picoted brides (I can’t tell how the picots are made). There is an attempt to preserve the often-seen 3-part pinwheel arrangement; look closely and you can spot it. Three 5-leaf motifs on stalks with a raised ring flower at the center. I’ve seen this kind of work in the past and find it quite interesting. Sold for $81.00, 6 bidders. 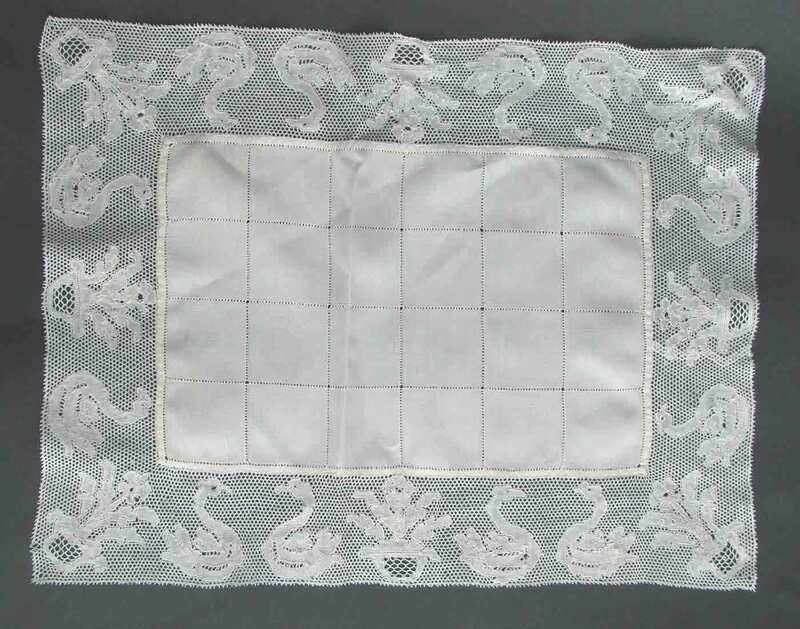 Comments: A border of combined bobbin and needlelace applique on machine net. It’s reasonably complex for a narrow piece; note the small decorative ‘mode’ fillings along the bottom bobbin-made motifs. 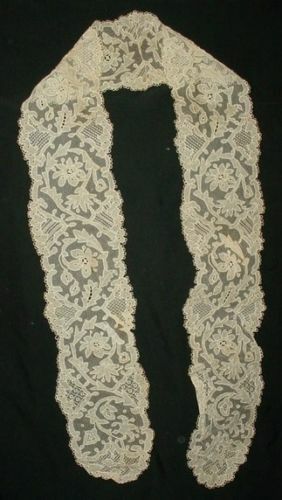 These alternate with a needlelace leave. There are three bands of decoration, that probably look better when the piece is ruffled than they do laid out flat. Good fine technique throughout. Damage: A few broken threads in the fillings. Some small holes in the tulle, a few breaks in the engrelure. Sold for £11.10, 2 bidders. Comments: We don’t see a lot of Point de Paris as we understand it today until about 1900. I think it must have grown out of the older pottenkant laces which also had a fond chant ground variation. This piece is part of a table linen set, and have not only the flowerpot but also swan figures, reflecting that possible earlier history. Good technical work, although the design is not all that refined. Soilage: Seller cites an ivory color. Finish: Vertical fold crease, some light creasing in the center cloth. Comments: These two piece match. 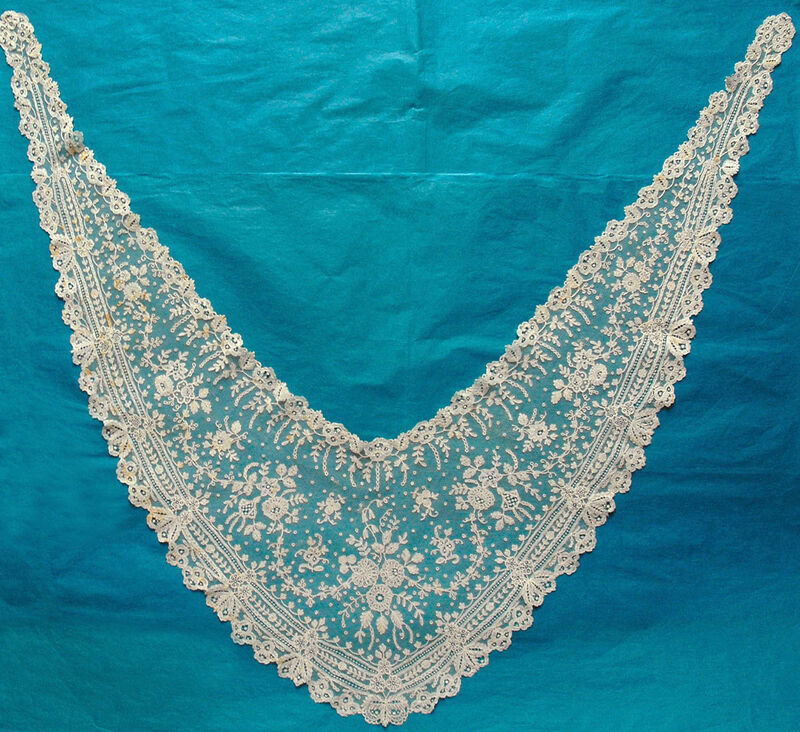 The first is an impressive shawl collar of Brussels bobbinlace applique on machine net. Good romantic floral design, small motifs showing some imagination in design, done in excellent technique. Needle-made fillings are basically rows of knots with a few plain and picoted rings. The second is rather an odd shape, but looks original. 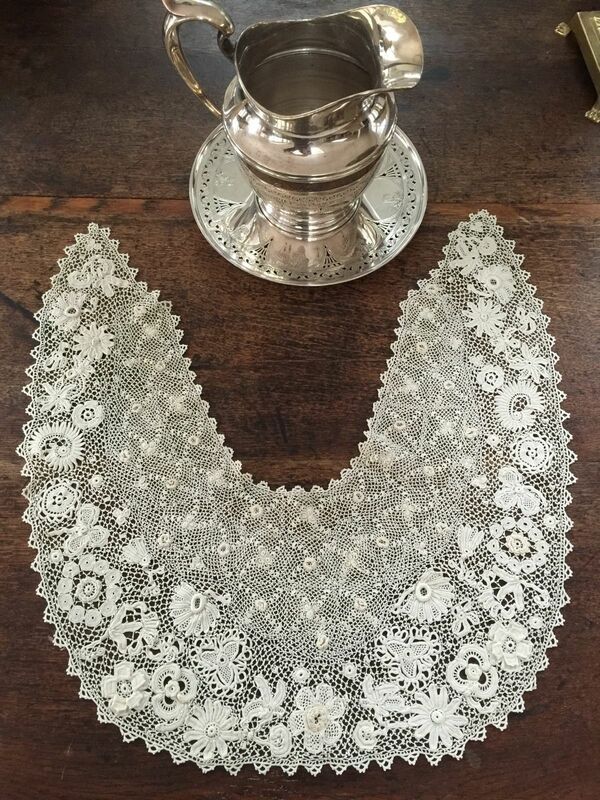 As the seller says, it is probably some kind of neck decoration, but I don’t know if it is meant to be attached to the collar. The design is slightly simpler than the collar, but they still match. Damage: For both – A few pinholes in the mesh. Some repairs to the tulle. Looks like one break between motifs on the neck-edge side near one tip of the collar. Soilage: Seller cites some brown age marks to the front on the collar, and brown age marks at the front of the border. Sold for £180.00, 1 bidder. Sold for £51.00, 2 bidders. Comments: I’m puzzled by this one. The thread looks like silk, but it doesn’t seem to be a Maltese piece (although that’s a possibility). Note the unusual ground, sort of a Dieppe variation, with really nicely done square tallies. And there’s a kind of honeycomb pattern along the outer edge. I’m thinking it might be a French piece from around Le Puy. Or maybe an Eastern European piece, perhaps even Russian? 11/29/15 – I just had a very welcome note from a LaceNews reader placing this in a category she calls “Erzgebirge and Eastwards”. 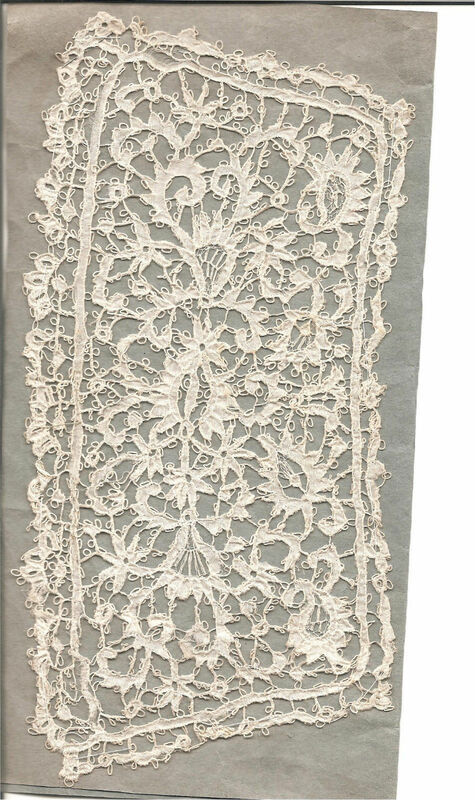 She’s seen this in silk and in patterns from lace schools from c. 1900 and a bit into the 20th c.
Provenance: From a 3 album collection that the seller acquired from Mr. Sigmund Sternfeld in the 1980’s. He got them at a museum auction in New York City.